Lately, many of us have been asking, is our skincare natural or organic? And if not, where do we find all natural skincare brands? Thanks to more transparency in the skin care industry and consumers being more informed, finding natural skincare brands is now much easier. Not only that, there are great new brands popping up all the time. 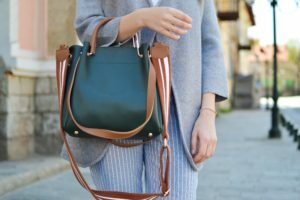 It’s natural, but is it effective? Many of these natural skin care brands are pushing the boundaries of natural ingredients, boosting their efficacy with the help of cutting-edge science. This isn’t your grandma’s natural skincare. Yes, you can smear yogurt on your face as a mask, but it won’t be as effective or as sophisticated, as a blend of natural active ingredients. In creating a list of my favorite natural skin care products, I’ve focused on the modern side of natural skincare. The kind of skincare that delivers visible results without resorting to unnatural chemicals and ingredients. Where someone will ask you what you’ve done differently to your skin. In what order should I use natural skincare products? Toner/facial spritz – first step after cleansing. I could read about skincare all day, but I know some of you have better things to do or are just busy living life. Here are my favorite all natural skincare products. 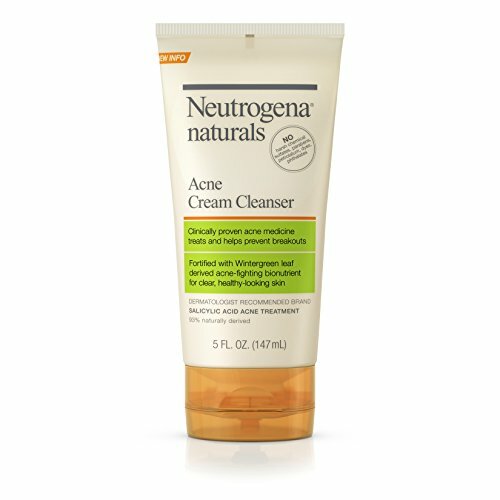 Affordable and effective on acne-prone or normal skin, Neutrogena’s cream cleanser is a good example of less is more. When it comes to cleansing your skin, it’s best to stick to simple formulas. This ingredient list, for example, is relatively short and simple, which can be very effective on acne-prone skin. Great in the morning or after removing makeup, this gentle cream cleanser leaves skin feeling fresh and comfortable. Most skin types, except very sensitive, would appreciate this cleanser. It has menthol and fragrance listed towards the end, which can be irritating to sensitive skin types. If you’re looking for the best organic skin care brands, look no further than Tata Harper. The formulas are organic and effective, not two things that always go together. 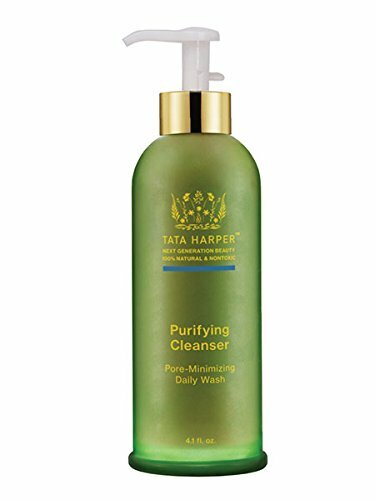 Tata Harper’s Purifying Cleanser is one of their top sellers, which is no surprise when you look at the sophisticated organic formula. All skin types except very sensitive skin, due to the essential oils. It’s marketed towards “oily or problematic” skin, but there’s no reason we can’t all enjoy its invigorating effects. Best used in the morning or in the evening after removing your makeup (a.k.a. your second cleanse in your routine), this is a nourishing cleanser that leaves skin feeling amazing. It’s especially great if you are feeling the effects of pollution and urban grime after a long day. It’s utterly refreshing and gives you a jump start thanks to the combination of natural extracts. After working for high-end skin care brands for many years, January Olds decided to forge her own path. With a focus on simple natural ingredients, she developed a carefully curated line of skin care products that optimize our skin’s natural state. 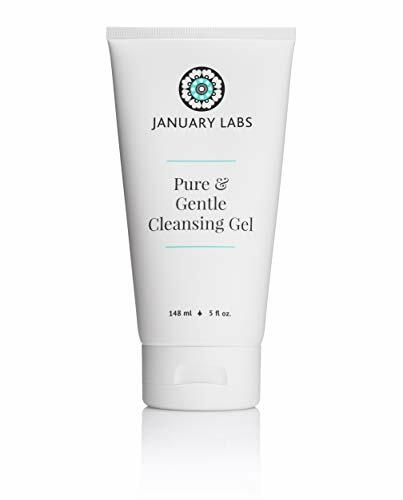 A non-foaming gel, the Pure and Gentle Cleansing Gel from January Labs, leaves skin feeling balanced. It’s especially great for tricky skin that is hard to please. It’s free of sulfates, parabens and artificial fragrance. Inside this gentle cleanser is a cocktail of anti-bacterial, antioxidant and anti-inflammatory extracts. Every ingredient pulls its weight — there are no filler ingredients here. In addition, the combination of extracts has been carefully put together for an optimal pH level in the skin. All skin types, but especially tricky skin with multiple issues. Water, Sodium Lauryl Sulfoacetate, Disodiumlaureth Sulfosuccinate, Organic Aloe Vera Leaf Juice, Ppg-2 Hydroxyethyl Coco/Isostearamide, Sodium Cocoyl Isethionate, Natural Salt, Grape Seed Extract, Vitamin E Acetate, Willow Bark Extract, Rosemary Leaf Extract, Vitamin A Palmitate, Bark Extract, Phospholipids, Sunflower Seed Extract, Licorice Extract, Papaya Fruit Extract, Vitamin C Palmitate, Sodium Lauryl Glucose Carboxylate Lauryl Glucoside , Corn Derived Preservative, Sodium Benzoate, Glycerin, Sodium Pca, Lime Oil, Chamomile Extract, Green Tea Leaf Extract, Citric Acid. The cleanser restores and nourishes the skin, while also protecting and strengthening. It dissolves makeup and dirt and does not strip the skin of moisture in the process. Like all of January Labs’ products, the main objective is to keep skin balanced and free from irritation. There are no unnecessary ingredients, so what you get is a carefully crafted blend of natural ingredients that will work. This is not your basic rose-based mist and includes a blend of natural antioxidants and healing ingredients that tighten and reduce inflammation. Most importantly the facial mist is 100% Vegan and is cruelty-free. Like a day at the spa, this face mist relaxes and rejuvenates your skin. It’s alcohol-free and combines natural ingredients to soothe, tone, and refresh your skin. Applied after cleansing your face, this creates a fine layer of moisture that will enhance any serum or moisturizer you apply next. Makeup applies smoothly with an extra glow. Not that I’m superficial, but the packaging is beautiful. It looks so nice on my vanity table and I find myself reaching for it throughout the day. I use it in the morning and night after I do my skincare routine, but also as a little pick-me-up when I’m feeling tired or my makeup needs a refresh. It leaves skin soft and calm and is a great base for serums or when used before makeup. It has five key ingredients – aloe vera, rose, witch hazel, hibiscus, and coconut water. The aloe hydrates and also heals the skin. Rose is full of natural antioxidants, which protects the skin from the effects of stress, pollution, and other external factors in our daily life. Witch hazel reduces inflammation and mildly tightens the skin. Hibiscus is naturally rich in Malic and Citric Acid, which evens out skin tone and improves cell turnover. Created by a woman who is passionate about holistic health and wellbeing, ILIA Beauty combines organic ingredients and results-driven products. If you’re looking for certified organic skincare brands, Ilia beauty is one to dig into. Take this toner stick, for example. We’re all used to seeing face mists and toners in liquid form. However, this twist-up toner has been designed to hydrate skin on the go. As a mom, I certainly appreciate the convenient design. This water-based toner plumps the skin while giving you hydrated, calm, and de-puffed skin. Featuring everyone’s favorite skin plumper, hyaluronic acid, it retains moisture in the skin like no other. It also features other soothing natural ingredients like Aloe, Chamomile, cucumber, aloe, and green tea. With a slight nod to Korean skincare, it also has sea buckthorn and camellia extract, which are both known for their rejuvenating and healing properties. In the last few years, hyaluronic acid has gone from being unknown to being the most sought-after ingredient in skincare. Here’s why. It can be used on all skin types, is natural, and adds unbeatable moisture to the skin in a lightweight formula. Gone are the days of heavy creams to hydrate your weathered-looking face. For many of us with adult acne or oily skin, that’s a sure-fire way to oilier and spotty skin. 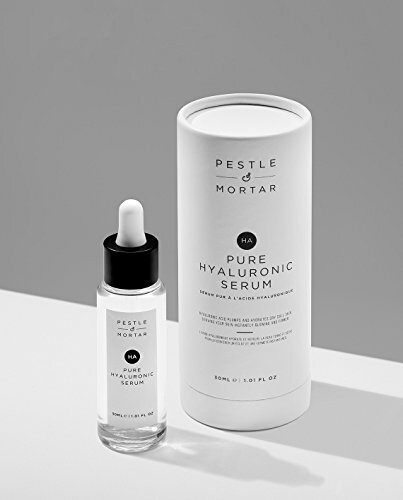 Now you can use lightweight formulas such Pestle and Mortar’s hyaluronic serum to hydrate and soothe your face. The best thing about hyaluronic acid is that it is lightweight and fits into anyone’s skin care regimen. To fully activate hyaluronic acid’s powers, it needs to be used with either a facial spritz or a light moisturizer. Doing so will allow it to do its thing, which is to keep moisture in your skin. All skin types and ages, but especially if you are dehydrated and have fine lines that need plumping. It hydrates and soothes without aggravating oily, acne-prone, or sensitive skin. It has a similar effect on the skin as drinking lots of water or getting a good night’s sleep. For that reason alone, I recommend this to friends with new babies or for anyone that could use a hit of moisture to their skin. I also love that it is free from parabens, alcohol, fragrance, or animal by-products. 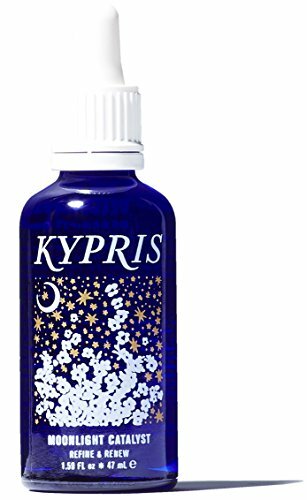 A natural alternative to retinol, Kypris’ Moonlight Catalyst is so natural, even pregnant women can use it. Generally speaking, pregnant women are told to steer clear of retinol. So to these ladies, staying on top of hormonal skin and wrinkles is totally possible with this pregnancy skin care solution. For everyone else, this is a natural alternative that will not compromise on results. All skin types, but especially if you have combination, acne, or dehydrated skin. The combination of pumpkin enzymes, peptides, and soothing antioxidants, makes this a heavy hitter in terms of an anti-aging serum. Once you start showing the signs of aging, this is the kind of product that will stimulate skin renewal (which slows down with age) and keep it looking it’s best. It improves skin texture, evens out skin tone, firms, calms, and plumps the skin for a radiant glow. Essentially, it does what retinol does but without actually using retinol. Probably one of the most trusted and well-known rosehip facial oils in the world, Trilogy’s Rosehip oil proves that not all oils are created equal. If you’ve never had skin problems or acne you might be fooled into thinking that a skin product that works for you, means it is great and can work for everyone. I used to think this about 10 years ago when I started out caring for my skin. I bought an organic rosehip oil at Whole Foods and it completely broke me out. Fast forward a few years later, after hearing all about Trilogy’s organic rosehip oil and I was back on the rosehip oil train. Extracted from rosehip seeds using an organic non-solvent process, Trilogy’s rosehip oil has the highest level of essential fatty acids and nutrients available. It has a superfine texture, which absorbs instantly into the skin. It contains a natural tretinoin, which is a derivative of Vitamin A, the anti-aging wonder. The combination of fatty acids and Vitamin A helps to smooth out fine lines and wrinkles, giving skin a renewed appearance. Continued use will prevent further fine lines from forming, which is one of my main concerns as I get older. Due to its natural healing properties, it can be used on fresh scars or on stretch marks during pregnancy. 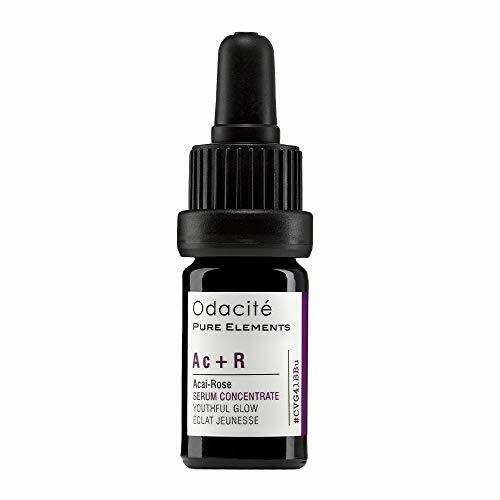 Odacité Ac+R Youthful Glow Facial Serum Concentrate, 0.17 fl. oz. Made from a combination of potent antioxidants and superfoods, Odacité’s youthful serum smooths and firms mature skin. Superfood Acai and anti-aging rosehips are the base of this beautiful serum, hence the name Ac+R. You only need 2-3 drops of this serum to improve your skin tone, texture, elasticity, firmness, and fine lines. Because Odacité makes every product in small batches, their skincare is ensured to be fresh and active. On the bottle, you’ll see the date it was created, rather than the traditional expiration date on some products. No preservatives are added to their serum, to take advantage of the properties of the ingredients in its freshest state. Due to its high concentration of antioxidants, this serum will improve your skin tone, texture, elasticity, firmness, and fine lines. You can either apply 2-3 drops directly to your face after cleansing or you can also mix into your regular moisturizer. I like mixing it into my moisturizer and find that it soaks in better this way. Ask someone with oily skin to use a facial oil and their face fills with fear. There is a misconception that using a facial oil will make oily skin even shinier and lead to acne eruptions. Not all oils are created equal. Made especially for oily skin, Herbivore’s Lapis facial oil is a light oil that balances oil production while also reducing redness and inflammation. It hydrates the skin, which prevents it from overproducing sebum when it is dehydrated. People with oily and sensitive skin can sometimes find it hard to find the right oil. The wrong kind of oil can be too rich for oily skin or not soothing enough for sensitive, reddened skin. By using a sophisticated natural oil blend, Herbivore solves the riddle that many oily people face — over stripping skin or adding too much moisture. Heavy in squalane, which is nearly identical to our own skin’s natural oils, it protects the skin from hyperpigmentation and acts as a light moisture barrier. Sold as an eye mask, Tata Harper’s luxurious eye cream also works perfectly left on the skin. I used it like a normal eye cream and it worked beautifully with or without makeup. If you’ve never tried Tata Harper’s products, do yourself a favor and look at their range. Everything is effective and is a joy to use. Those with puffy eyes, dullness, and fine lines. Anyone over 30, but especially dehydrated mature skin. It has a thick, balm-like texture, so it will moisturize dry skin that has fine lines or wrinkles. If you’re over 30, work in a dry atmosphere, travel often, or haven’t found an eye cream that hydrates deeply enough, this is a luxurious natural cream that pulls out all the stops. If you can afford it or have spent money over the years looking for the right moisturizing eye cream, you will be impressed with this cream. I’d categorize this up there with La Mer, but this is the natural and organic version. The skin around our eyes is quite delicate, so wrinkles show up more when our skin is not properly moisturized. Luckily, one of the easiest ways to look younger and more awake is to simply moisturize the area. 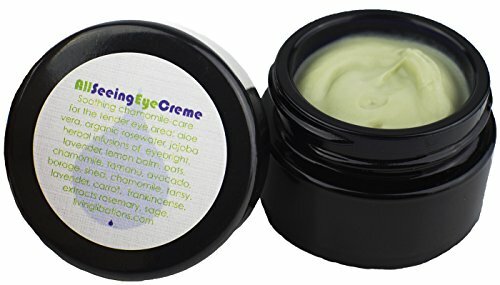 Made of a blend of natural ingredients, Living Libations eye cream contains Vitamins A, B, E, as well as anti-inflammatories and fatty acids. It is a rich cream that quickly plumps the skin around the eyes, making it look healthier and softer. It’s a quick fix to a common problem. Those fine lines or wrinkles. Aloe Vera, Rosewater, Golden Jojoba Oil, Cape Chamomile Essential Oil, Blue Tansy Essential Oil, Carrot Seed Essential Oil, Frankincense Essential Oil, Rose Otto Essential Oil, Herbal Infusions of Eyebright, Lavender, Lemon Balm, Milky Oat Straw, Chamomile, Tamanu Oil, Avocado Oil, Borage Oil, Shea Butter, Rosemary, Sage. 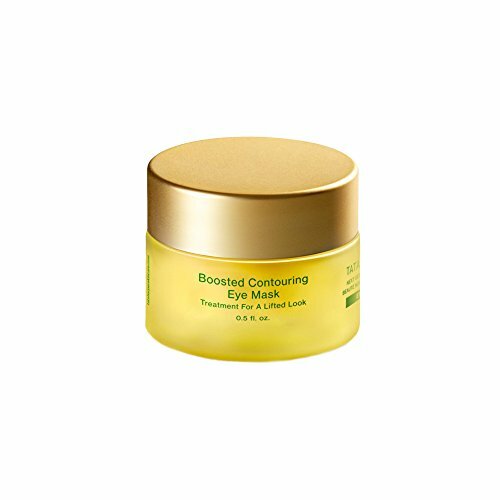 Light and moisturizing, this eye cream plumps fine lines and moisturizes skin in a natural and soothing formula. 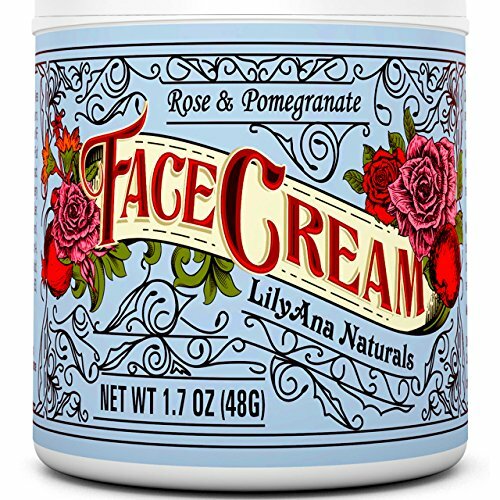 With the prettiest vintage packaging I’ve ever seen, this face cream is a one-stop shop for adding moisture and plumping fine lines. Full of organic ingredients, it is a wonderful base to use alone or under makeup. It can be used all around the face, including the delicate eye area. If you are looking for a budget natural face cream, this is a good option. It’s not as fancy as some of my top picks, but it is lovely and hydrating. Rose Distillate, Aloe Vera Juice, Kosher Vegetable Glycerin, Avocado Oil, DMAE, Emulsifying Wax NF, Meadowfoam Seed Oil, Pomegranate Fruit Extract, Organic Orange Fruit Extract, Organic Lemon Extract, Organic Cranberry Extract, Vitamin E, Vitamin C Ester, Ethylhexylglycerin, Phenoxyethanol, Coenzyme Q10, Pro-Vitamin A, Vitamin A, Alpha Lipoic Acid DL- Thioctic Acid, Panthenol Vitamin B5, Vitamin B3, Carrot Oil, Lecithin, Citric Acid. Healing extracts and antioxidants make this anti-aging cream a natural way of preventing crows feet and fine lines. It features rose, pomegranate, aloe, vitamin C, vitamin E, and many more natural ingredients. Used on cleansed skin, it moisturizes skin deeply, which reduces the appearance of fine lines. In adding moisture to the skin, it also increases elasticity and improves skin texture. This cream was so natural, even my husband got into it. He doesn’t want to complicate his morning and night, so finds this easy to apply. Packed full of antioxidants and soothing ingredients, this face cream from Andalou Naturals is sophisticated and effective. It maintains a balanced skin and protects it from the common aging effects of pollution and stress. Fruit stem cells give skin an added dose of vitality, while remaining natural and organic. Sensitive skin, dry skin, normal skin. Not acne-prone. Sitting between a light and a heavy moisturizer, this day cream sits perfectly on dry or normal skin. On oily skin, I would suggest a small amount in the palm of your hand and then thinning it out with your favorite facial mist (or water). It’s my little hack to thin out rich creams in the Summer. After applying to cleansed skin, it absorbs quickly and works almost like a primer under makeup. It reduces the look of fine lines thanks to the inclusion of hyaluronic acid, which is my favorite skin care ingredient (and yours too if you’re over 35). There’s no reason to put unnatural ingredients on your skin, especially your face, because there are so many amazing products out there. I could easily have included 100 more natural skincare products. As a busy mom, it’s useful to see what is available out there. I could have used a handy guide when I was pregnant, but take this as my way of paying it forward. Hopefully you’ve gotten a few ideas from my guide. Please let me know your favorite skincare brands that I haven’t listed.